Today I spotted an interesting UI idea on eventim.de. In order to highlight the search field on the main page and remind the users to use this function, eventim uses an animated placeholder text in the input field. They are showing 6 different examples of search terms (additionally, the terms seem to represent current popular artists and events). I’m not quite sure about the effectiveness of this technique but like the approach. It would be really interesting to know some numbers or results of A/B and usability tests. What do you think? “Attention to Detail”-Series: In this series I try to spot little details in user interfaces or ux design which make the difference. See more Examples. I love the fact that Goole wants to know how you want to be called in case this name is different to the legal name. Lovely detail in Google’s application form. “Attention to Detail”-Series: In this series I want to find little details in user interfaces or ux design which make the difference. See more Examples. Noah is a short film created by Canadian film students Walter Woodman and Patrick Cederberg which shows how teens use the internet today. And it’s scary how real it feels. This collection of minimal football club logos created by Amer Amin is just awesome. I like nearly every approach. See all logos on Behance. Make sure to take a look at the whole project and his other works. Good to see Electronic Arts is pushing the use of multiple screens to improve the gaming experience in Battlefield 4. I don’t know wether all this features will be really useful or just kind of “nice to have” but it’s a way with a lot of potential. It’ll be very interesting to follow this topic in the next months and years. Last year DDB New York created the #FirstWorldProblems campaign for Water is Life. I wrote about it and pointed out that I liked the idea a lot but don’t agree with the faked execution. Now there is a follow up campaign called #5YearsToLive. Very emotional and very cute. Great work, DDB NY. The whole campaign will include the hashtag #5YearstoLife, as well as video clips featuring American kids, who probably won’t die at five years, reciting their own bucket lists. After 2 years full of adventures, night shifts, intense experiences, crazy ideas, traveling, great advices, hard decisions, red bull, awesome people, inspiration and vibrant places I finally made it. 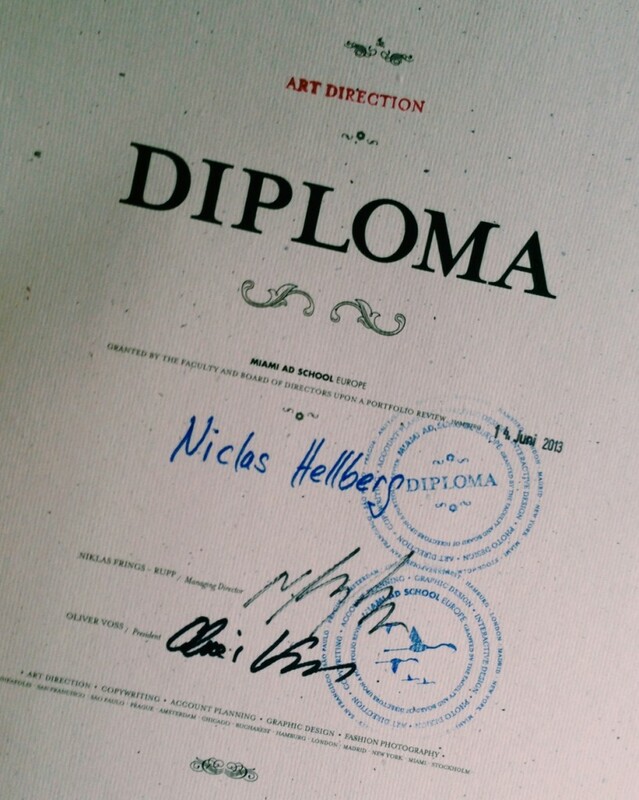 I graduated from Miami Ad School Hamburg. Tomorrow, me and my girlfriend will escape to Sweden for one week to enjoy the short freedom :) After that I’m happy to start a new chapter of my life and accept a new challenge!